Because people routinely got hurt trying to move product vertically and it was tough slow work, they developed a better more efficient and safer method. They developed industrial lifts such as mezzanine lifts, scissor lifts, vertical lifts, and dock lifts. 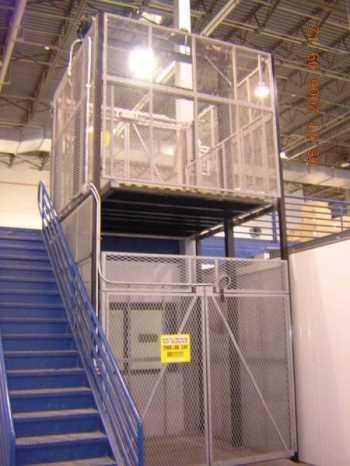 Industrial lifts significantly improve efficiency, productivity, and safety. Mezzanine lifts typically have large decks that can move quantities of product to a mezzanine level. Scissor lifts are typically used to position product at an ergonomically determined height. Vertical lifts typically move product to high heights and multi-levels. Dock lifts typically move product between ground height and dock height. None of these industrial lifts, and there are more, are rated to carry people. No people allowed! CSI provides industrial lifts such as a mezzanine lift, scissor lift, vertical lift, or dock lift. If you do not see specifically what you are looking for Contact Us, we are here to assist you. Request a quote and put our professional personnel to work for you. We also offer other equipment to move product vertically such as Conveyor.